Radha Botofasina is a harpist and singer. She first recorded four devotional albums with the late Alice Coltrane, her spiritual and musical mentor. Alice Coltrane also gifted Radha with her first harp. She awakened an interest in Radha about the harp—the beauty of its harmonics and the freedom of its motion. 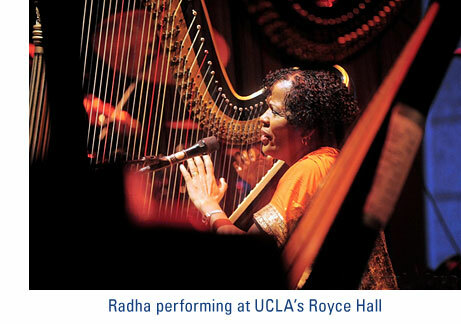 Radha performs in many venues on harp, such as the Royce Hall at UCLA, The Ebell Club of the Wilshire Ebell Theatre to name a few. Radha began her vocal studies while a student at Goddard College in Vermont with teacher Joyce Vos-Kadwell. She continued under the tutelage of Martin Lawrence in New York City, with whom she studied for five years. During that time, she also studied jazz piano with the noted player and composer Mary Lou Williams. Through her association with Alice Coltrane, Radha learned how to sing beyond what her "mind" allows and to go vocally where her heart takes her. Radha is a multi-instrumentalist—on piano, organ, synthesizer, harp, guitar and voice (mezzo-soprano). She is also composes music and is a record producer.